Executive Chef, Paul Froggatt, brings together a stunning presentation of gourmet events, with boutique producers, for one very decadent weekend at Huka Lodge. This very exclusive Huka Lodge celebration of gorgeous food and wine will not only inform and inspire, it will also introduce our guests to some wonderful experiences. On Friday afternoon Sabato will present a Wine & Cheese pairing session with a highly knowledgeable cheesemonger and an equally skilled sommelier. Guests will then gather for pre-dinner canapés and Executive Chef, Paul Froggatt will present an exquisite five-course dinner. The next morning a leisurely brunch will be accompanied by Louis Roederer Rosé Vintage Champagne. 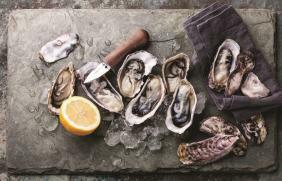 Early afternoon, Chef Paul will have guests engaged with his popular cooking demonstration, focussing on fresh, shucked oysters and how best to enjoy them. In the evening join a cocktail clinic, with plenty of opportunity to taste the results..
Dinner will showcase a series of food stations - Chef Paul has sourced the very best fresh whitebait, Wagyu beef, crayfish, cured ham, caviar, smoked salmon and other delicacies to be presented with his characteristic respect for the quality and integrity of each ingredient. Cost for a two-night stay in a Junior Lodge Suite, on a double/twin occupancy basis, inclusive of all listed activities. NZ$1,050.00 + GST per person, per night.